By providing free unlimited data, unlimited free voice / video calls, unlimited free SMS and unlimited Free access to Jio Apps, Reliance JIO is undoubtedly the most popular mobile network at this moment. Other Telecom / mobile operators were actually shocked by the Reliance JIO Loot Offers, tried many different things to join this race, but failed each and every time. Things would have been more brighter for Reliance JIO, If the price range for the 4G VoLTE enabled phones, came under the purchasing power of normal population. People from the lower grade, still dreaming about having a 4G VoLTE enabled Smart Phone with JIO Happy New Year offer bundled into it. Have you heard anything about Reliance Jio Rs 1000 4G Mobile, If not please read this to the end. Today, we are here with a GOOD NEWS for the people, unable to Buy a 4G VoLTE enabled Smart Phone due to their low purchasing power. According to the reports from some reputed sources, Reliance JIO’s LYF brand is going to thrill the telecom market once again, by the introduction of the cheapest 4G VoLTE enabled Smart Phone, LYF Easy. This least expensive 4G enabled Smart Phone will surely fit into everybody’s budget at an unbelievable price of INR 1000. The LYF Easy 4G enabled Smart Phone is proposed to HIT the telecom market in February 2017. Meanwhile, you can check LYF Easy Smart Phone specifications and features below. 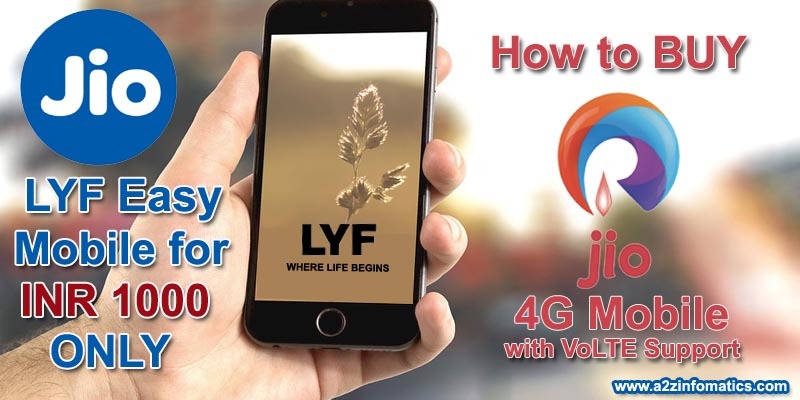 Reliance JIO Lyf Easy 4G VoLTE enabled Smart Phone Price / Specifications / Features / Availability / Online Registration / Frequently Asked Questions (FAQ’s) / Flash Sale. Reliance JIO Lyf Easy 4G VoLTE enabled Smart Phone Specifications. Reliance JIO LYF Easy Availability: February 2017. Screen Display Size: 4 inch. Resolution: 480 x 800 Pixels. Camera: 5MP (Rear) & 2MP (Front) with Auto flash. Supported Networks: 4G LTE & WCDMA. Battery: Removable Li-Ion 1500 mAh battery. Warranty: 12 months for the Mobile and 6 Months for Accessories. Reliance JIO Lyf Easy 4G VoLTE enabled Smart Phone Features. Reliance JIO’s LYF Easy will provide true access to the Internet and Gaming experience. The 4 inch WVGA display of LYF Easy mobile will provide ideal display clarity. 5MP rear and 2MP front camera will give optimal picture quality, great money value at this price range. LYF Easy mobile comes with Spreadtrum 9820 processor. LYF Easy mobile has all the needed basic features like Camera, Wi-Fi, Hotspot and Bluetooth. Here comes the much needed, demanded feature, LYF Easy mobile is 4G VoLTE enabled. Last but not the least, Eligible for the JIO Happy New Year Offer till 31 March 2017 (expected to extend till 30 June 2017). Steps / Process / How to BUY Reliance JIO Lyf Easy 4G VoLTE enabled Smart Phone. Register yourself at the online platform, which will be authorized later to sell Reliance JIO’s Lyf Easy Smart Phones. Most probably it will be Reliance Jio’s Official Website / Store. Update your delivery address prior to buy Lyf Easy Phone, as in the initial sale period it will get “out of stock” within a short period of time. Look for the Lyf Easy phone’s availability and check if they agreed to deliver at your shipping location. If they don’t agree to deliver at your shipping location, update your delivery address to any relative’s or friend’s address and check again if that’s accepted (they agree to deliver). Now, HIT Buy Now button at the Lyf Easy Smart Phone online web page. On the next page, Select the accepted delivery location. Make / Complete the order payments using any preferred or available payment option at the website. At last, Confirm your ORDER. Check your provided email address and mobile for the order confirmation messages. Congo!, You have successfully ordered Reliance JIO’s Lyf Easy 4G VoLTE enabled Smart Phone. Your Smart Phone will arrived at the given delivery address within 5-7 days. Enjoy JIO Happy New Year offer till 31 March, 2017. Availability of Reliance JIO Lyf Easy 4G VoLTE enabled Smart Phone. At this moment, this is the frequently asked question among the community. As informed earlier, LYF Easy INR 1000 Smart Phone is likely to HIT the telecom market in February 2017. No specified date have been announced by the RJIL (Reliance Jio Infocomm Limited) till date. Once we get the confirmed availability date for the Reliance JIO’s Lyf Easy 4G VoLTE enabled Smart Phone, the same will get updated here. Keep visiting our BLOG regularily. You can also SUBSCRIBE us to get the latest updates about LYF Easy Smart phone directly to your mailbox. Online Registration for Reliance JIO Lyf Easy 4G VoLTE enabled Smart Phone. At this moment, we have very limited information related to this section. There are strong indications there will be no Flash Sale for LYF Easy mobile. Reliance Jio Infocomm Limited is planning to distribute this much awaited cheapest smart phone using an online application process at their official website. This section will be updated once the Lyf Easy Online Registration process starts for the people. Flash Sale for Reliance JIO Lyf Easy 4G VoLTE enabled Smart Phone. Although there is no schedule for any Flash Sale to distribute LYF Easy Smart Phones among the public. You can still check the major online retailers for the availability of Lyf Easy Mobile Phones. Reliance JIO is known for their surprises, who knows if they are planning for the First Flash Sale of Reliance JIO’s Lyf Easy S4G VoLTE enabled Smart Phone at Flipkart, Snapdeal or Amazon. If that happens, here are the advance wishes for your chance to get Lyf Easy Smart phone. Best Alternative Smart Phones for Reliance JIO LYF Easy 4G Mobile. For any reason, If anybody wants to try any other brand than of LYF, below are the best alternative mobile options having the similar specification of the LYF Easy Smart Phone. Forget about the Price Comparison, Reliance JIO’s LYF Easy 4G Mobile is the cheapest mobile on the planet. Frequently Asked Questions (FAQ’s) about Reliance JIO Lyf Easy 4G VoLTE enabled Smart Phone. Question: Is there any official announcement about introducing Reliance JIO’s Lyf Easy 4G VoLTE enabled Smart Phone @ Rs 1000? Answer: We understand why this question came to your mind. Don’t worry, the answer for your question is a big YES. At the time of “JIO Welcome Offer” launch, Reliance JIO owner, Mr Mukesh Ambani had announced to introduce this cheapest Lyf Easy smart phone. many reputed sources had already confirmed that the Lyf Easy phone is under process at the production unit and will soon HIT the market with a BANG. Question: Is the Lyf Easy Smart Phone is the cheapest Smart Phone available in the market? Answer: Everybody now a days is a shopping freak, why don’t you make your own research to find the confirmed answer. Yes, without any doubt, Lyf Easy smart phone is the cheapest and will remain the cheapest Smart Phone avaialable in the market. Question: What is the price of Reliance JIO’s Lyf Easy Smart Phone for the general public? Answer: Actually the answer for this is very simple & straight, it’s INR 1000 only (including all taxes). Question: Please tell me the expected release date for the Rs 1000 Lyf East Smart Phone? Answer: Earlier the Lyf Easy smart phone is expected to arrive in the market in mid January 2017. Due to some production delays, it’s now expected to HIT the market anytime in February, 2017. Question: How can I Book / Order Lyf Easy Smart Phone after release, is there any online registration or flash sale to get the Rs 1000 mobile? Answer: Once the Lyf Easy Smart Phone get released on the expected schedule, we got some strong indication that the phone will be available at official Reliance JIO Infocomm website. Sorry, we don’t have any confirmed news about online registration thing. There are very rare chances for any Flash Sale for the Reliance JIO’s Lyf Easy Smart Phone. Keep visiting this place for the latest updates about this particular information. We hope everybody has found this piece of information helpful. Although the release date for the cheapest Smart Phone @ INR 1000 is not declared yet, keep your fingers crossed, the LYF Easy Smart Phone is ready to HIT the Market any time. If anybody has any secret information about the availability of Rs 1000 LYF Easy mobile phone, please do share the release date under the comments section below. That’s all we have for now, we will be back with many more “Dream Come True” stuff like this. Thanks for the visit, keep checking the latest news about Reliance Jio’s cheapest LYF Smart Phone @ INR 1000. Best of Luck.